South Africa has made incredible progress since apartheid, but it still must address its corruption and deepen its democracy. The post-apartheid country has made enormous strides. But its progress won’t be complete until it deepens its democracy. 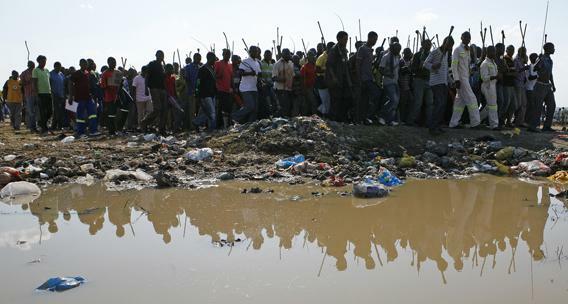 Miners protest a hospital’s move to release their injured colleagues into police custody near Rustenburg, South Africa, on Sept. 11, 2012. JOHANNESBURG—Twenty years ago, I visited South Africa and got lost. I set out from my hotel in Durban in search of a small black college where some leaders of the African National Congress (ANC) party were meeting in advance of the country’s first post-apartheid elections. I drove around Durban’s white suburbs for hours, looking for a building that was not on my map because, technically, it was not in Durban. It was in Kwazulu, one of the black “homelands” that existed alongside but legally separate from the white neighborhoods. When I stopped for directions, nobody I asked had ever heard of the college, even though it was only a few miles away. South Africa’s Truth and Reconciliation process, which sought to “restore justice” after apartheid and heal historic wounds, is widely admired and often imitated, and rightly so. Given how bitter the conflict seemed when I last visited—Kwazulu was the scene of a violent ethnic struggle—the relative peace that reigns in relatively integrated South Africa feels miraculous. Unlike so many countries that have been through similarly profound transitions, South Africa retains strong democratic institutions, including high-quality media, decent courts, and a well-organized civil society. But while South Africans dealt brilliantly with the racial and historical legacy of the apartheid state, they have dealt less well with its corrupt economic legacy and the legacy of the security institutions created to repress the majority of citizens. Apartheid was, among many other things, an elaborate system of job protection for poorer whites, guaranteeing them high wages and benefits. Especially in its final years, apartheid offered political insiders, in the words of one economist here, “an almost unchecked opportunity for graft.” Members of apartheid police, espionage, and military institutions enjoyed almost limitless opportunities to exert power. Old ways of thinking die hard—and institutions don’t die unless you set out to kill them. Certainly the idea that the state exists to protect a privileged group of workers has not disappeared: It lives on in powerful trade unions (now black rather than white), mass unemployment (still among blacks), and policies designed to discourage investment in the sort of low-cost, labor-intensive factories that have led to higher growth in other developing countries. In recent years, local sheriffs, backed by national unions, have shut down dozens of such factories, to the detriment and anger of employees. Insider capitalism also lives on, including through an ANC-owned company, Chancellor House, for example, that enjoys privileged access to state contracts and channels its profits to the party. Meanwhile, a group described as the “securocrats” have repoliticized various military, police, and intelligence agencies. Nowadays, that means they are loyal to the president, Jacob Zuma, who once was the head of intelligence for the ANC when it was in exile, rather than to ordinary citizens, such as the striking miners police fired upon last year. The not-surprising result has been a series of scandals in recent years. In 2005, a South African judge found a businessman guilty of soliciting bribes from a French arms company on behalf of Zuma, then the deputy president. A power struggle followed, security agencies launched investigations of each other, and the prosecutor’s office was weakened in the process and remains leaderless. Despite South Africa’s varied and independent media—which has parsed and analyzed this story at length—and the country’s decent courts, this story is one of many that have never been resolved to anyone’s satisfaction. There is only one solution to all of these problems, as everyone knows though not everyone admits: South Africa needs to continue its revolution, neutralize the security state, change its economic policies, and above all deepen its democracy. Before South Africa’s justly admired transition can be considered complete, South Africans must vote for a peaceful transfer of power. This could happen at the next general election, in 2014, or the one that follows. After two decades, the ANC, the undisputed winners of South Africa’s transition, will have achieved full success only when they lose.